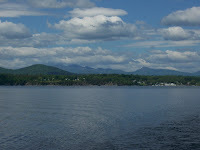 Today's photo is a shot of the incredibly beautifulAdirondack Mountains from across Lake Champlain. I sometimes forget how the Adirondack peaks seem to spring up out of the clouds. Sometimes it just takes a little distance to see the true nature of things. I believe it is time for an update on who I am and what this blog is all about. I am Joann and I am hooked on living the active and healthy life of the Adirondack Mountains in upstate New York. This is my blog about what it is like to live, work and play in these mountains; living and loving the Adirondack Lifestyle! I am a real estate agent and business broker with the fine real estate professionals of the Prudential Terry Horrocks Real Estate Agency in Lake Placid, New York. I started this blog last fall and am now hooked on chronicling the moods, activities and news of the Adirondacks. I indulge myself in an occasional rave about stupendous ski conditions or a great trail run, and try mightily to refrain from ranting about slow drivers, politics and stupid behavior. If you are interested in learning about the Adirondacks or how you can enjoy this lifestyle on a full or part-time basis, please feel free to contact me. Or just read the archives and come back for the almost daily dose of musings on the Adirondack Lifestyle.